Spring has sprung, or at least begun to sneak into our afternoons, and it’s time to think about shrubs. When warm weather begins, I spend a lot of time thinking about the trimming, digging, and planting that need to be done. I don’t manage to get to the part where I get out in the yard to do something about it though. When we have a perfect sunny, warm afternoon, I find myself too busy sitting outside having a drink with a friend. Luckily, there’s more than one kind of shrub. One is on my to-do list. The other can be in my drink. I love a happy coincidence! I can think about shrubs, enjoy the outdoors, and relax all at the same time. It seems like every restaurant in my neighborhood has a new list of specialty cocktails for each season. I love reading these lists. The names are clever. The pairings of gin, tequila, and rum with fresh fruit, citrus juice, and fresh herbs sound sooooo refreshing. Of course, I order one. Then I take a drink. More than 90% of the time my enjoyment ends there. Most of these cocktails are too sweet for me. I don’t object to desserts, but I don’t like sweet drinks – tea, lemonade, soda, flavored water, and coffee drinks do not appeal. I don’t like the way they taste. They don’t refresh and they leave me thirsty. That’s not to say a slight drizzle of honey won’t improve a drink. It might. But the standard is simple syrup…and plenty of it. Shrubs appeal to me because of the tang of vinegar. If you must use sweet, at least balance it with acid. A few years ago when vinegar bars became popular, I eagerly anticipated the arrival of the trend in my city. That never happened. But a more subtle inclusion of vinegar sometimes appears on a cocktail menu in the form of a shrub. A shrub is a syrup made of vinegar, botanicals, and yes, sugar. Historically, it was a way of preserving fruit. Taste-wise, it is meant to fall on the acidic side. If you want an even more tangy shrub, you can easily make one at home. Most shrubs are made using apple cider, white wine, or red wine vinegar, but you can also use balsamic. 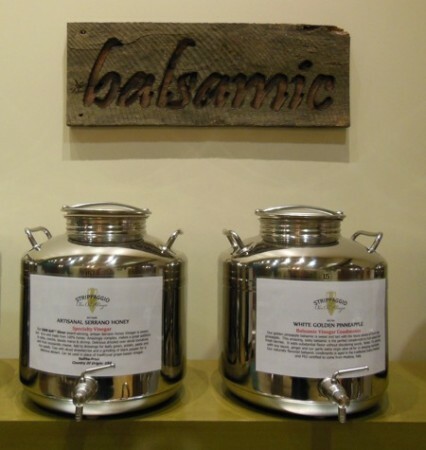 A blend of balsamic vinegar and sweet cherries sounds delicious to me. Some recipes I’ve seen cut the balsamic with apple cider vinegar. Red wine vinegar would be worth a try as well. I’m describing a shrub that feels more like fall. How about something lighter for spring? Pineapple, white wine vinegar, and rosemary might fit the bill. And you don’t have to make it at home. 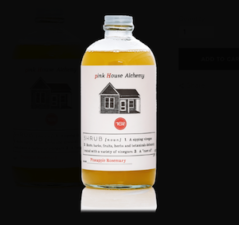 You can buy it in a bottle from Pink House Alchemy. If I’m ordering, I’m going to have to include a bottle of cardamom syrup as well. It’s too intriguing to pass up. And to continue with this digression, I keep wanting to create a sassafras tea granita. Sounds like I’m heading for a spring porch party! Anyway, you can make a shrub at home by cooking fruit, vinegar, and sugar together or by letting the fruit and sugar macerate, adding the vinegar and letting it sit for a few days on the counter or in the refrigerator before straining. Tomato based shrubs can be used to make bloody mary-like drink. A blueberry shrub can be used for a daiquiri-like drink. And no alcohol is required for a refreshing shrub beverage. A little seltzer will do the trick. It seems like it’s time for me to grab some fresh fruit and a few bottles of vinegar and do some flavor experiments. Until I get them right, I’ve learned that I can order those fancy named specialty cocktails without the simple syrup. I don’t know why I never thought to request that before, but I tried it the other night and enjoyed my drink much more. Sitting in the sun smelling fresh cut grass and sipping on refreshing tangy drinks with a small group of friends sounds heavenly. I may have to do it several days in a row. We only get a few weeks between too cold and too hot and humid. We have to make the most of them! Cheers! Let’s Go Green With Avocado! Even if you don’t recycle, you can still go green with avocado! It’s time to bring the focus back to food for a minute. Spring hasn’t quite arrived, but I’m already craving salads made from fresh, tender spring greens. The farmers market in my neighborhood will open in April. In the meantime, I’m creating salads using red cabbage, baby arugula, and kale. I’m not a big fan of most bottled dressing so I usually toss something together at home. 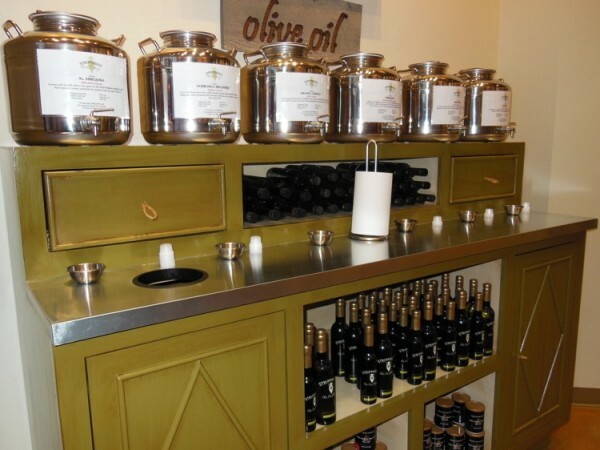 I use a variety of vinegars-balsamic, apple cider, rice wine, and white wine-and pair them with extra virgin olive oil. 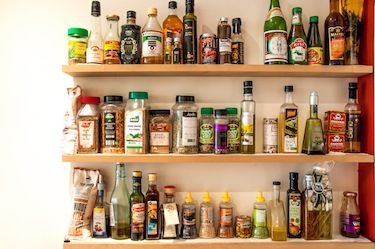 Sometimes I’ll buy oil or vinegar infused with herbs, peppers, or fruit for some extra flavor dimension. For creamy dressings, I used to start with yogurt. Now I prefer avocado. Avocados have a creamy texture and plenty of fat to serve as a base for dressing. They’re a great dairy alternative. And they provide lots of yummy nutrients. One-third of a medium avocado has 1 gram of protein, .3mg of iron, 250mg of potassium, 11mcg of vitamin K, 45mcg folate, .7mg pantothenic acid, and .1mg copper plus iron, vitamins C,E,& B, thiamin, riboflavin, niacin, phosphorus, magnesium, zinc, and manganese. That same serving of avocado has 3g dietary fiber and no sodium, sugar, or cholesterol. 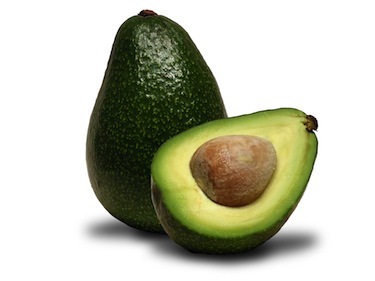 The fiber content combined with unsaturated fat makes avocados filling, heart-healthy, and diabetes-friendly. Place avocado, coconut yogurt, and Sriracha in food chopper and pulse until smooth and creamy. Place avocado mixture in medium bowl. Stir in salt, pepper, and orange juice. Refrigerate until ready to use. Keep the avocado turning from turning brown by adding a squeeze of lemon or lime juice before refrigerating. If you’re not in the mood for salad, you can always use avocados to make guacamole. In addition to the traditional dip or salad, I sometimes use guacamole instead of mayonnaise or mustard on a sandwich to give it a boost in flavor and moisture. It’s especially good with roasted or fajita chicken. Don’t forget to add avocado to your poké bowl. It’s delicious with rice, tofu, cucumber, carrots, edamame, and salmon, tuna, shrimp, or chicken. Of course I would be remiss if I didn’t mention avocado toast. If you don’t want to make it at home, it’s most likely served at a coffee shop near you although it may not be gluten-free. I’ve seen recipes that call for adding avocado to salsa, margaritas, and even pudding. I can see using them in muffins or fruit breads in the place of butter although I have not tried this. But that’s what going green with avocados is all about…using them more often and in more variety. Have fun going green and bon appétit! Sometimes in the kitchen I just have to mix and match. I grew up on a farm so it wasn’t convenient to shop at the grocery store often. We planned and purchased for a week at a time. 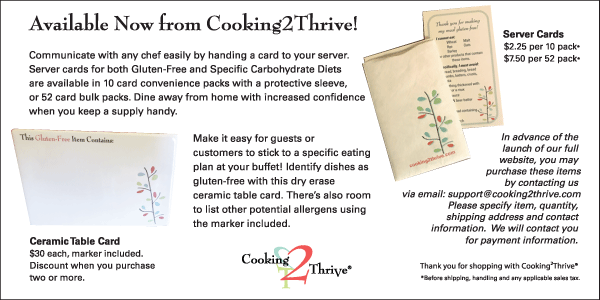 If we decided to vary the menu from our plan, we sometimes had to make substitutions. Those habits stuck with me. I tend to shop once a week with a loose plan in my head. In between trips, I mix and match to create the meals I desire. 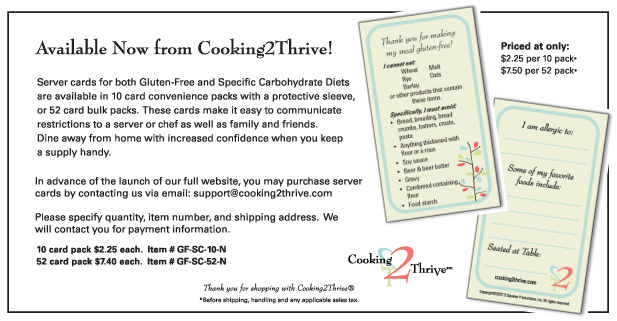 While our Cooking2Thrive recipes go through at least three extensive tests to make sure the proportion of each ingredient is just right, my everyday cooking is haphazard, thrown together, and, more often than not, delicious! I’m rarely deterred by lack of an ingredient. I recently decided to make tuna croquettes. They’re one of my favorite quick & easy go-tos. I keep them really simple like my grandmother did. She always mixed canned salmon, an egg, crushed saltines and a sprinkle of salt and pepper. Then she pan fried them in melted butter. I use tuna rather than salmon, but other than that I follow her lead. Technically, these may not even be croquettes to you. They have no béchamel or brown sauce. They’re not rolled in breadcrumbs, and they’re shaped like round patties instead of cylinders. Nonetheless, they’re quite tasty. Five-ounce cans of solid white albacore tuna in water are staples in my pantry. I combine one or two cans with one egg, gluten-free breadcrumbs, and a little salt & pepper. I never measure, I just add breadcrumbs until the mixture isn’t too wet or dry to hold together. Then I make patties and pan fry them in butter. Most recently, I began making the croquettes and realized I only had about a tablespoon of breadcrumbs. That’s not enough. I had no crackers or bread on hand. I did have an open bag of Cheetos® puffs (yes, I know those aren’t healthy). I placed a handful of them in a plastic bag and crushed them to use in place of the breadcrumbs. I had to crush a few more, but they worked like a charm! I had never before considered using Cheetos in croquettes, but there are substitutions I make on a fairly regular basis. I add vinegar to regular milk to use in place of buttermilk. I use coconut crystals in place of brown sugar. I use dates or honey to sweeten muffins or cookies. I substitute anise for fennel or vice versa. I mix and match citrus all the time depending on what I have handy, sometimes adding a little apple cider or rice wine vinegar to enhance the acidity of lemon, lime, or orange flavor and balsamic vinegar to enhance cherry. Last week I baked some tilapia to serve over rice. I really wanted the fresh punch of a pico de gallo as a finisher on top. I had no cilantro, lime, or peppers on hand. What I had was grape tomatoes, yellow onion, and basil stir-in paste. I thought why not see if I can combine these into something that will add the cool acidic top note I’m looking for? I chopped the tomatoes and onion into small pieces, added a small dollop of the basil along with some salt and pepper. The resulting salsa enhanced the fish and rice perfectly even though the flavor profile varied from pico de gallo. At some point, most of us will discover we lack an ingredient needed to finish a dish we’ve already started cooking for dinner. That’s a great time to mix and match. If you’re not sure where to begin, a guide to pairing flavors can be helpful. Check out the award-winning book – The Flavor Bible: The Essential Guide to Culinary Creativity, Based on the Wisdom of America’s Most Imaginative Chefs. Or just do what I do and wing it. Cooking is as much art as science. I can’t tell you how I know a substitution will work. I just see it in my head. You may be able to do this too. There’s nothing wrong with giving it a try! Mixing and matching may make your food a little less predictable, but in my experience, no one seems to mind as long as it’s tasty. Strippaggio – A Tasting Adventure! My first experience with Strippaggio turned out to deliver unanticipated excitement. Strippaggio is both the name of a local retail establishment and the Italian word for the process of filling your mouth with oil and then slurping so air spreads the oil up your nasal passages coating the taste buds with flavor. I love any shopping experience that involves tasting something exotic or unusual, so I decided to make Strippaggio the first stop in an evening of birthday dining. My friends Chris and Heather joined me. 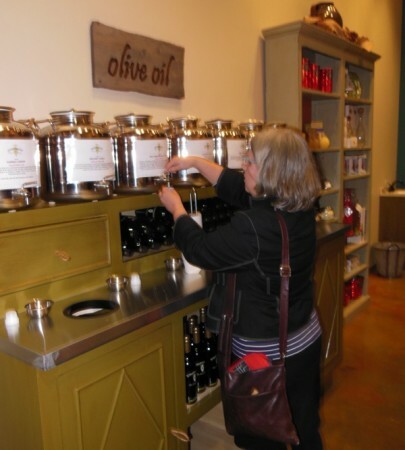 The boutique offered around 50 varieties of fused or infused olive oil, roasted oils, and flavored vinegars. Neat rows of stainless steel jugs with spigots sat atop counters that conveniently contained small plastic cups, rolls of paper towels, and a waste bin along with already bottled portions of the top selling varieties. Each jug was labeled with a description of the contents and flavors letting us know what to expect before choosing our next taste. 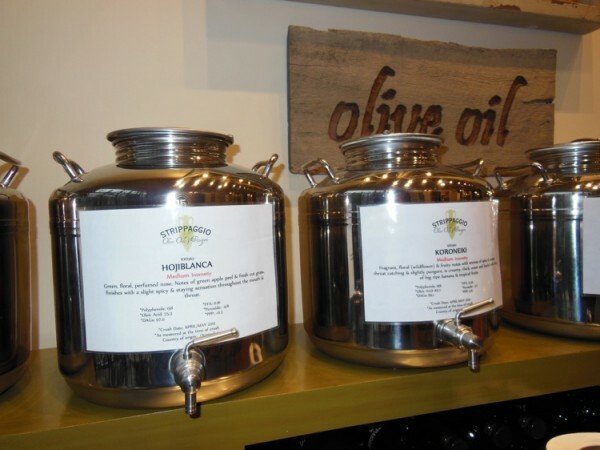 We began with a lime infused olive oil that was bright and fresh, then followed it with infused wild mushroom and sage. The wild mushroom variety turned out to be one of my favorites and one that I had to take home with me. After a few more slurps of infused oil, I was ready to mix it up with some of the vinegars. Our host cautioned us not to slurp the vinegars, just to taste them. We tried white pear and cranberry, blueberry, chocolate, espresso, fig, maple, raspberry, and a spicy serrano honey vinegar. After three or four sips, we returned to the oils. Then back again to the vinegars lingering over the sweetness and dessert appropriate chocolate balsamic and pondering a pairing of raw pecans with the maple balsamic. Things were going well until Chris slurped a vinegar, coughed choked, cried, and laughed. I felt for him, but I was laughing too. One more caution from the host and we resumed our tasting by buying a package of pecans and dipping them in maple, blueberry, and chocolate balsamic. The maple was definitely the best. Finally, I was ready for one last review of my favorites so I could decide which to purchase. After a quick taste of roasted sesame oil, I returned to the serrano honey vinegar. While I can’t tell you for sure what I did, I assume I slurped it as I swallowed. The vinegar burned the back of my mouth and my throat immediately closed. I could not move air in or out. It was as if I had something blocking my airway, but there was nothing there. I paced, Heather worried, the host asked if I was alright, Chris stood in the back of the room and waited to see if laughter or 9-1-1 was the next appropriate move. After a few seconds that felt like an hour, I was able to loudly force air back through my throat. I sounded asthmatic. A few more breaths like that and I could cough, cry, then laugh. Everyone laughed. I felt glad to be alive. I wasn’t willing to buy the serrano honey vinegar this time, but I will. Instead, I went home with two other varieties and a survival story. I wouldn’t have missed the experience for the world. 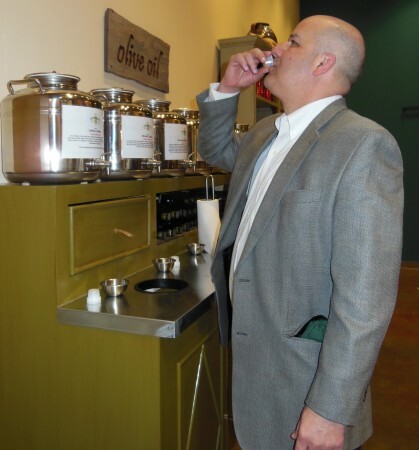 I highly recommend the tasting – just make sure you pay close attention to whether you’re tasting vinegar or oil. If you don’t, you may get an unexpected adventure as well.